South Korea’s conscripted soldiers will soon be allowed to go off base and to use cellphones in barracks after working hours, the country’s military said Thursday, as part of efforts to improve basic rights for rank-and-file soldiers. The Ministry of National Defense also said that starting next year, the military will ease restrictions on vacation destinations for soldiers, who have been prohibited from going to places deemed too far for them to return to the barracks on time. 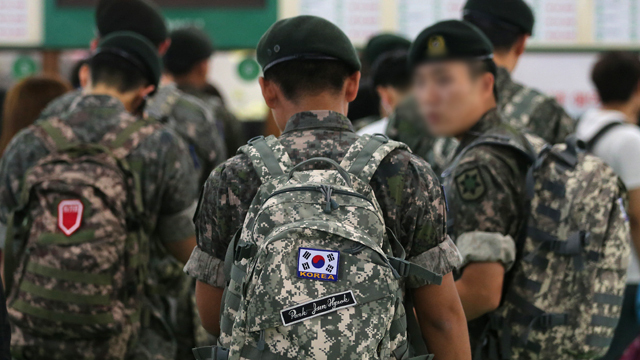 Every Korean able-bodied man is required to serve in the military for between 21 and 24 months, and the conscripted are prohibited from leaving the barracks unless they are granted vacation authorized by the military. “By ensuring basic rights for men and women in uniform, we are going to create a creative, liberal military culture, while maintaining combat discipline,” Defense Minister Jeong Kyung-doo said. The measures are part of efforts to overhaul the country’s rigid barrack culture, which has been blamed for military crimes over the past decades. Reports of corporal punishment and shooting incidents caused public outcry and prompted calls for change. While the 600,000-strong standing troops have played a significant role in fending off invasion by North Korea and other threats, the unprecedented inter-Korean detente this year has provided more leeway for the liberal Moon Jae-in administration to take reform measures. The Moon administration has announced its plan to reduce the number of troops and their mandatory service period. The military has also allowed alternative service for conscientious objectors and pledged to implement the system in 2020. “The military is in charge of the reform, but the outcome is only judged by the people,” Moon said on Dec. 20, after being briefed by the Defense Ministry about the military reform plan. "Troops can only become powerful after the military earns the people’s trust." Regarding eased restrictions on off-base activities, the Defense Ministry said troops will be allowed to leave their posts after 5:30 p.m. and to return to the base by 9:30 p.m. The scheme will be fully implemented in February after going through a monthlong trial. Off-base activities are limited to twice per month and granted only when the military deems that readiness posture can be maintained, the ministry said. Each base is required to have more than 65 percent of its troops remaining in the barracks. Starting early next year, the use of cellphones will be allowed between 6 p.m. and 10 p.m. on weekdays and 7 a.m. to 10 p.m. on weekends or holidays. However, taking photos and using recording devices are prohibited, the ministry added. Restrictions on destinations for troops’ leave of absence are to be eased in accordance with the consideration of general-level commanders. The ministry said it would consult with leaders of local municipalities on the matter.